Where does the Gerbil come from? Gerbils live in semi-desert areas in Africa, Asia and India. They are burrowing animals and were once called “Desert Rats”. They are dirurnal naturally, but pet rodents are more likely to be crepuscular – meaning that they are most active at dawn and dusk. The most common gerbil in the pet trade is a Mongolian gerbil. You may also see fat-tailed Gerbils called Duprasi or various types of Jirds or a similar rodent called Jerboa. 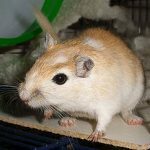 If you are new to gerbils, you will want to start with Mongolians first. They were brought to the U.S. in 1954 by Dr. Victor Schwentker for use in research when it was discovered what good pets they can be. Gerbils are about 6-12 inches long half of which can be made up of the length of their tails. They typically weigh about 80 – 100 gms – it is useful to have an idea of what they are weighing, using a small container on your kitchen scales. If your gerbil weighs 120g or over, it is time to put them on a diet! The natural, wild colour of gerbils is agouti/brown. There are over 20 colours that your gerbil can come in, which include various markings all over their coat and can have black or red eyes. Nose that is clear of mucas, free of scabs. Gerbils are very social and are happier in pairs. Female gerbils are more likely to declan so should be kept in pairs only, males groups may be stable at four. It is vital to note that you cannot introduce an adult gerbil to another adult gerbil without a split cage and you cannot introduce a single gerbil to an established group – with the exception of two just weaned pups (under 8 weeks) to an adult male. They are extremely territorial and will fight an intruder to the death. If you are adopting a lone gerbil, please read our guide to Split-caging a Gerbil first. Please note that not all split cages will work and you must be prepared to watch them very carefully, even after the divider has been removed. Your gerbil may be alright living on their own – some gerbils will not accept a friend if they have been alone for too long – but they will require a great deal of attention and affection from you instead. Spending time with your gerbils every day to socialise them. Gerbils are very quick, active rodents. Ensuring that they always have access to food and water. Ensuring they always have some activity/toys to play with and something they can do to exercise. They can get bored rather easily. That you have the time and money to pay for any veterninary bills. Gerbils are very active rodents with a strong sense of curiosity. As with all rodents, Gerbils need to gnaw to keep their incisors trimmed. You can find appropriate toys in most pet shops. They can be tamed with a bit of patience and will even respond to you when you come near the cage, and react to their own name. Burrowing is vital for a gerbil, so make sure they have plenty of room to dig. A wire cage is useless and boring to a gerbil and a plastic one would not take them long to chew through and escape. To this end, a glass tank is the best environment for them, especially if you make sure you have cardboard tubes or boxes that they can use to support their tunnels. A wire cage/tank topper can be used on top of the aquarium as this will give you an easy place to attach wheel and have a sand bath without them getting buried. Alternate layers of hay and substrate help support their tunnels – whilst also giving them something to chew.They are cleaner than hamsters or mice, and need cleaning out every 2-3 weeks. Sawdust can aggravate their eyes so it is advisable to get an alternative burrowing substance such as Megazorb, Ectobed, or Finacard. Chewing is their second love, if you have gerbils you can worry less about recycling cardboard and give your empty boxes to them. Obviously make sure these are clean, free of sellotape/staples and labels – you’ll find chunkier cardboard is preferred. Chewing is important for keeping their teeth at a proper length. Pets at home and the like do a cage version called a Gerbilarium which consists of a glass tank with a wire top. Bear in mind that the smallest version of this is not suitable for a pair of gerbils AT ALL. A solid based wheel is essential as gerbils go through bursts of heavy activity. You may also find an exercise ball a good investment, if you do not have a floor or surface suitable to let your gerbil free roam when handling but the appeal of this will vary according to their personality. A solid wheel such as a silent spinner. Chunky tubes or tunnels. (Note that the cardboard tubes that posters/wallplanners come in can be ideal) or smaller ones such as the inserts of toilet roll or kitchen roll. A hanging hammock or fluffy bed. Depending on your gerbil these may last forever, or be destroyed within a day – if the latter, just buy some cheap tea-towels to use instead! Sand bath for cleaning in, although some gerbils use these as a toilet! Your pet food supplier has food and treats formulated specifically for Gerbils. Onions, citrus fruits, celery and watermelon can give them tummy aches and should be avoided. Gerbils love sunflower seeds, but limit the amount to avoid illness and excessive weight gain. Basic seed mix: such as a commercial gerbil, hamster or mouse food. Supplements: you can mix in foods such as rabbit pellets, crushed oats, wheat, corn flakes, pumpkin seeds, monkey nuts and small amounts of sunflower seeds. Fresh: washed greens, vegetables and fruit . Things such as bananas, grapes, apples, carrots, dandelions and lettuce. Water: Gerbils require very little water, but some should always be available for daily use. Treats: protein such as small amounts of scrambled egg, boiled chicken, cheese or tuna are appreciated. Small pieces of bread or millet are also popular. Before handling, have a quick check of your room to close doors and block any obvious holes. Like all rodents, never lift or pull a gerbil by its tail. Give your new pets a chance to settle down to their new home before you attempt to handle them and it is often a good idea to try hand feeding them first to get them used to your smell and voice. Try scooping your Gerbil up in both hands from its sides and them sitting down to let them run over your lap. If this does not work you can try placing a cardboard tube in their cage and gently picking them up once they are inside. Gerbils are surprisingly fast but if you lose one to the floor do not panic. It may take you some time to recapture, but you will be able to do it. Just pause and listen for the tell-tale sounds of chewing. You may hear an odd drumming sound, where one gerbil is drumming its feet against the floor to call to its cage mate. If you can corner a gerbil in a small room or hallway then do so, then simply lean down and scoop as normal – be carefully to hold your gerbil gently but tight so they do not simply leap back to the floor. If this does not work then sit down on the floor yourself and simply wait until the gerbils come to you. Then, whilst they are nibbling your socks or even climbing onto your lap, then it should be relatively easy to pick them up. If all else fails then a trail of food to a cardboard tube, or a ladder into their cage will also work wonders. Please see below for a video of a well-trained gerbil on an assault course! NB: please note that this gerbil has had training for this. You’ll need a lot of time and patience to get the same result with your pet.